Here it is! Maryland's Official Utensil! 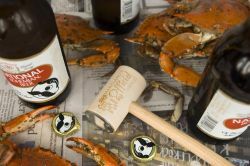 A wood crab mallet and a bottle opener for your Natty Boh! Proudly Made in Maryland Hon!! !